Every one of the 17 students walked away with a tool chest that was stocked with tuned-up hand tools – thanks to you. It was an awesome experience, both for the students and myself. Thank you. This week-long class affirmed my undying optimism that the craft has a great future. I’ve always told pessimists that woodworking is written in our blood and that it doesn’t take much to awaken that primal connection we share with the forest and all it gives us. For the last five days we lived in the forest behind the school. We took our meals there. And during the day we worked like dogs to build a tool chest and the skills that ensure that the craft won’t stop with this generation. Yeah, I know all that sounds hokey. But the truth is that governments, corporations or institutions won’t raise a finger to sustain the craft. It’s up to you. And it’s do-able. This fact lays a little heavy on me tonight because this class is the last one I’ll be teaching for several years. I need to edit and write some books, build a lot of stuff in my sketchbook and restore a building. This entry was posted in Woodworking Classes. Bookmark the permalink. You Sir, have certainly expanded our knowledge both in the immense amount of research you have done, as well as the books, dvd’s, classes and of course blogs that you have posted. Your enthusiasm shows through in everything you share about the craft. I’m happy to say that you have opened my eyes to the craft, and I can’t wait to learn more each day. I also apologize for probably falling into the category of “that student” by falling too far behind in the class, hopefully next time we meet, I will be past that! Congratulations to all the participants in the class. Now the burden is on you (them) to make the experience worthwhile for years to come. God Bless you for what you have done and what you do. You have inspired me to somehow teach and give back. There are 17 new craftsmen in the making. I hope we will hear from you in your new season of life. Your comments are always pointed and clear. God Bless your souls. This has surely made a lot of woodworkers, past and present, feel like the craft will live on. 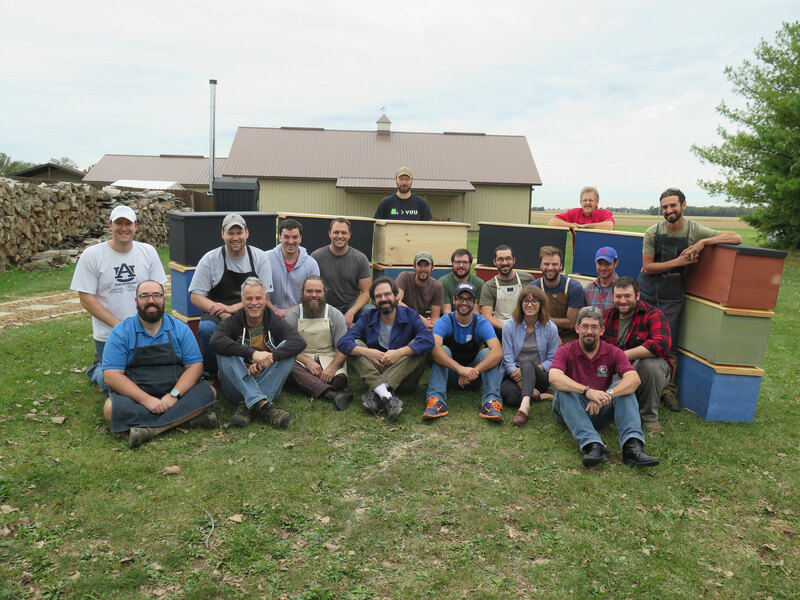 These students, hopefully, will encourage future generations of woodworkers. Good luck with your future endeavors, we’ll be watching. Best wishes in your new adventures. As a former student of yours (Roubo class in CT Aug 2015) and reader of your blog and books you inspire me in this craft that I love. Thanks Chris! Good luck to you and your family. Thanks for all you do Chris. Your work has made me a better woodworker in so many ways. I hope that when you start teaching again I will have a chance to take a class with you. Empowering a new batch of makers seems like a mighty fine way to start the next phase of your endeavors. Fantastic project – based on the pictures the students got a head start on skills that may have otherwise taken years to figure out through trial and error. Thank you for the opportunity to be involved! I enjoyed every moment. Good luck to all of the students, and when the opportunity arrives to teach or assist someone newer than you, seize it!! The reward will be yours if you do.